Sheesh, this has been a crazy month. It’s been so long since I’ve posted here I haven’t the slightest idea where to start. 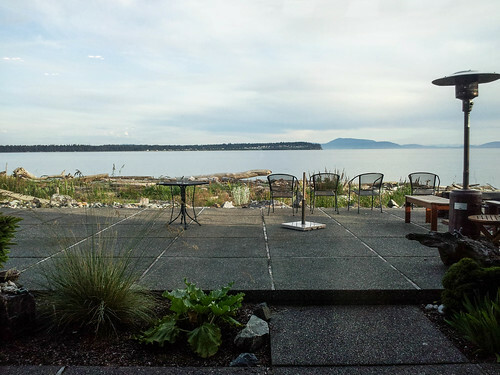 There was a trip to Orcas Island to scatter my grandparents’ ashes, immediately followed by a trip to Kansas City for a memorial service for my mother-in-law. A few great dinners with friends at which I took no pictures because it seemed too much like work, and a few meals cooked at home in between various outings. I definitely have some great stuff to post here but my brain doesn’t seem to working in a straight line (the 90 degree heat may have something to do with that). How about I start with our last supper club event? The theme was Tuscan family dinner. It was a lovely evening on Birch Bay, and we started with a bocce tournament, at which Jon and I stomped everyone until the very last game where we were soundly defeated. I have seldom met a sport better suited for playing while holding a glass of wine in one hand. The only downside of winning so many games is that we hardly had any opportunity to help eat the wonderful prosciutto and steamed artichokes that Jenise put out for antipasti. 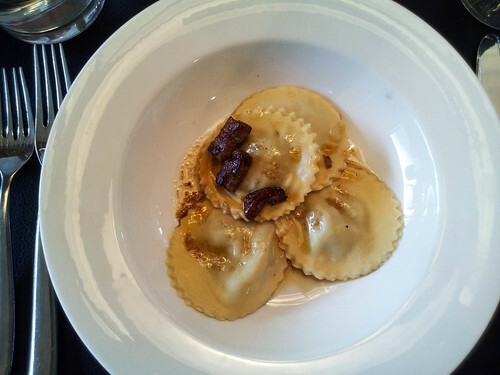 Eventually we came in and sat down to a devastatingly good first course of handmade mushroom ravioli with bits of foie gras on top. Daaaaaaang. 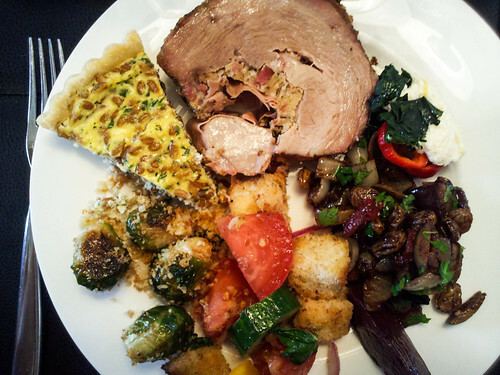 Then the rest of the dishes came on – there was an incredible pork roast, a plate of kale with peppers and ricotta, panzanella, caponata, turnips and Brussels sprouts. 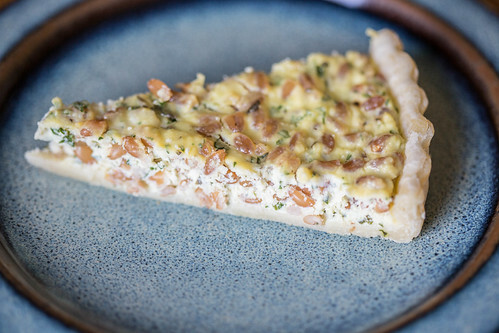 I contributed a farro and ricotta tart (recipe below). God it was a lot of food, like an Italian Thanksgiving feast. Then, when we all felt like we could eat no more, Jon served up gelato. All of my memories of wandering around Florence as a twenty-one-year-old involved gelato, so we had to have it here. 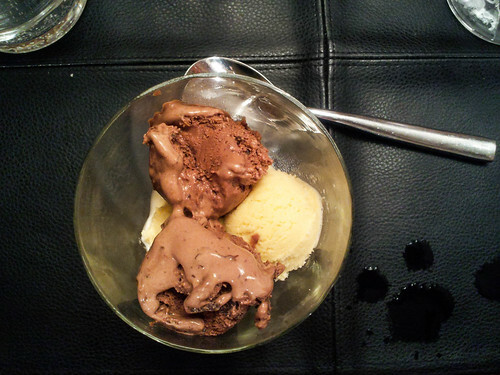 He made a chocolate gelato with straciatelle (dark chocolate streaks), and a zabaglione gelato with Marsala and lemon. 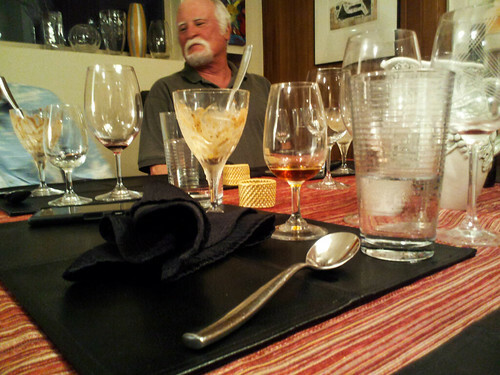 We drank grappa and nocino and whatever wine was left on the table. 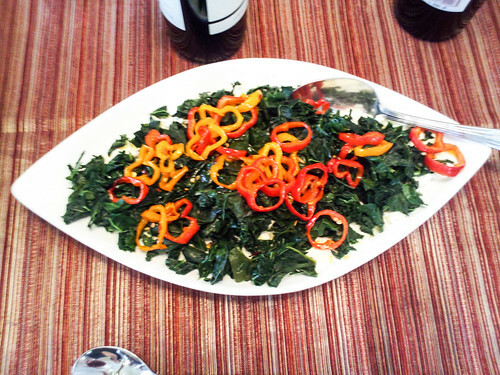 Another great meeting of the Bellingham Supper Club. Whew! I got this recipe from Italian Slow and Savory by Joyce Goldstein, who claims that it’s a traditional dish from the Garfagnana region of Tuscany. 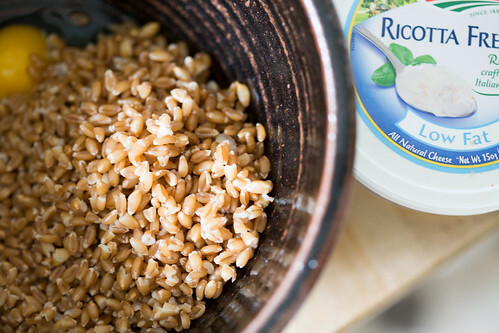 I wasn’t at all sure what to expect but I liked it – it was very subtle in flavor, so it was a bit overwhelmed by all the other dishes, but I liked the nuttiness of farro combined with cheese and herbs. 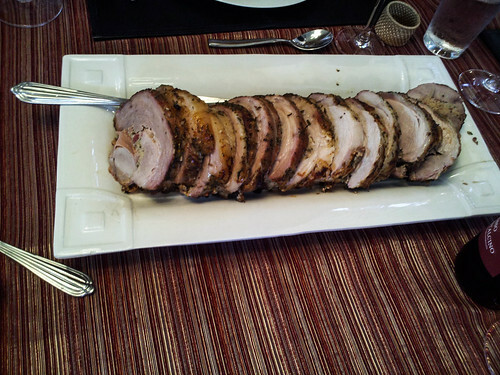 Next time I would serve it alone with a green salad, maybe as a first course. She gives directions for both a pastry crust and a breadcrumb crust; I just used my favorite basic pie dough recipe. Mix up the pie dough ahead of time, cutting the butter into the flour and salt, then adding ice water until it just comes together. Form into a round, wrap with plastic and refrigerate until ready to assemble the tart. Preheat the oven to 325°. 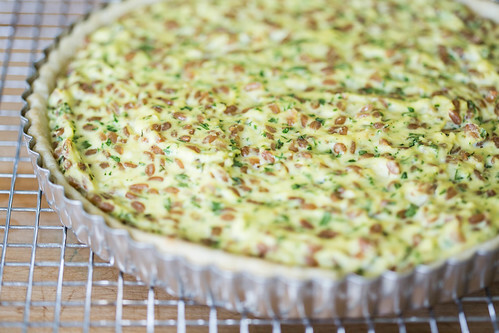 Roll out the pie dough and lay into a tart pan with a removable bottom. Pat the dough into the corners and use a rolling pin to trim off the edges. 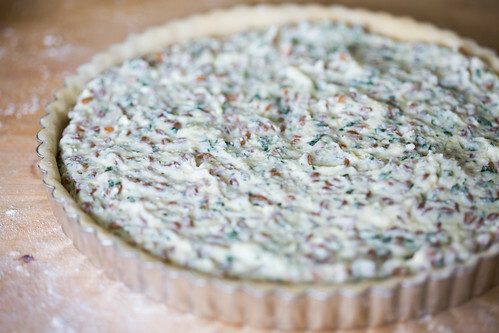 Combine all the filling ingredients and scrape them into the prepared crust. Put the pan into the oven and bake until set and lightly golden, about 40 minutes. Let cool, unmold and serve. Next > back in K.C.